Dreamy sounds envelope my ears, so I might be listening to dreampop. This is one of the descriptions I find online of the Dutch band Meadowlake. The cover art somehow fits the moniker, black and white greytones and a shadow. Tranquillity and arrested beauty in one. 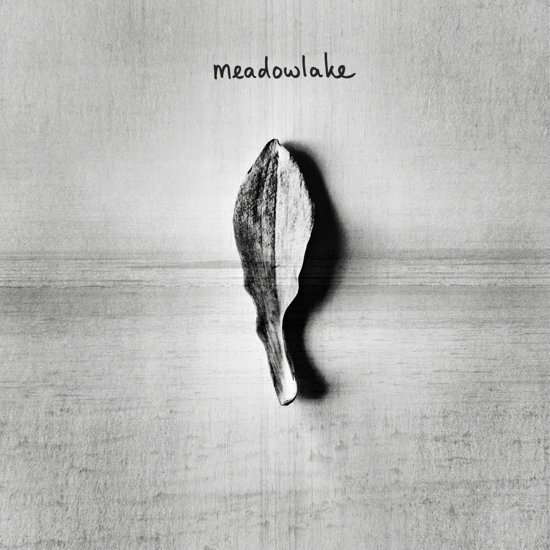 Meadowlake is a band from the north of The Netherlands, Groningen to be exact. After going through a minor breakthrough in 2014 with the EP 'Elegy', the band took its time to come up with its first full length album, released on 11 May. On the 10th I visited a show by Soup in Zoetermeer (read on here: http://wonomagazine.blogspot.nl/2018/05/the-pure-magic-of-soup-live-de.html), a band specialising in monolithic, yet extremely beautiful music. It is exactly that idea coming into my mind listening to 'Go', the opening song of 'Meadowlake'. Without ever reaching the extremes Soup goes to, Meadowlake presents itself and the song as a whole, built around a central theme, with soft singing overriding the melody and beat. 'Go' starts with some dark synth sounds, before a keyboard melody takes over. Slowly drums come in, a bass, guitars are strummed. The singing is subdued, almost hesitatingly. As if the singer is afraid of what we will think of his singing. Not unlike Maggie Brown's Marcel Hulst. The song slowly is flashed out into ever larger spheres with another layer added to the whole creating a wall of sound, where all is captured behind that new layer, yet heard by those who truly listen. 'Go' is the right introduction to the music on 'Meadowlake'. If you like it, I can assure you you will be fine with the rest of the album. The band obviously loves to flesh out songs, but not before the basis has been boned to the marrow and it knows exactly where all that flesh needs to go. One moment it is the bass that has the lead, then a guitar and at other moments the keyboard. Meadowlake varies its sound this way and gives all members their moments to shine. The drummer is always there when passages need bolstering up in the firmest of ways. By playing this kind of music Meadowlake dips its pen in 80s ink, while remaining in the 10s where the sound and production are concerned. It is not hard to discern some Simple Minds in a song like 'Hot Punch'. The echo's of 'Someone Somewhere In Summertime' or 'Up On The Catwalk' are all over the place in the delay on the guitars and keyboards and in the firm drumming. The difference is Meadowlake is so much more modest. 'Hot Punch' is not aiming (yet?) for arenas and is happy to be played in Vera and The Cavern Club. Singer Jarno Olijve is no Jim Kerr and obviously does not want to be him. He stands his own ground in the musical breezes and storms the band kicks up around him. I can imagine there's some shoegazing going on around him as well. There's no need to do so out of shame or modesty. The music stands its ground. I have said so before and will say it again here. This small country is spawning one good band after the other in a time when hardly anybody can live from making music anymore. It's a shame for the musicians, but the audiences and listeners can only be glad. With Meadowlake another such band has stepped up to the roster. Enjoy it while you can and buy an album from them along the way.